While Rajkot might not be on a typical tourist's to-do, we chose to explore the unexplored and discovered that there is a lot you can still do and see while you're visiting. We compiled a list of things to do while you're visiting this gem of a city to ensure you have a blast while visiting the city, check it out! Typically a Gujarati phenomenon, the festival of Uttarayan is the most colourful time in the city of Rajkot. Celebrated in the month of January every year, it is that time when almost all normal routines and activities come to a standstill as kites of various colors, shapes and sizes (some only those you've imagined) fill up the skies of Rajkot (and across all cities of Gujarat). From early morning to late at night, Uttarayan provides lots of fun and beautiful sights that you will remember for a long time. No matter what your background or beliefs, if you are in Rajkot (or anywhere in Gujarat) in January, you will no doubt find yourself flying kites with everyone else. The one thing that unites everyone visiting or living in Rajkot is their love for food. Whether you love anything else or not, if you love food, the city of Rajkot will welcome you with arms wide open! Street food across Rajkot is very popular and we can vouch for the hygiene and cleanliness ourselves ( you will too, looking at the large crowds that are out on the streets gorging on yummies). Don't forget to hit up Rasikbhai Chevdawala (famous for the typical namkeen mixture 'chivda' and patties), Jaysiyaram Pendawala (famous for its mouthwatering sweets especially pendas aka pedas), and Mayur Bhajiya (famous for its hot piping varieties of bhajjis). Our mouths are watering, what about you? Ate too much? Don't worry, Rajkot's got your back. Head to Fun World, a popular and sprawling amusement park located at Race Course Ground. Spread over 5 acres of vast land, Fun World was the first of its kind when it was setup in 1990. From the Raging Bull that requires real grit to hold on to, and Horror House where your fear factor is put to test, to enthralling rides like the roller coasters, Harakiri and Sky Train where screams and excitement, both are unlimited. While India is known as a land of religious diversity, you must visit Rajkot to see what religious diversity really looks like. The city is blessed with very many sacred places, and it will redefine religious harmony for you. Don't forget to visit ISKCON Temple on Kalawad Road, Hazrat Gebanshah Pir Dargah near Railway Station (Junction), Prem Mandir Church on Kalawad Road, and the Gurudwara at Shastri Nagar. While it might not ride high on its tourism, Rajkot does have a few places and structures that might interest the tourist in you, especially if you love history (did you bunk history classes in school?). Don't miss out on Alfred High School, renamed to Mohandas Karamchand Vidyalaya (owing to the fact that Mahatma Gandhi himself studied here), Rotary Midtown Dolls Museum (a unique museum dedicated to dolls from all around the world), Watson Museum (a museum that houses antics and artifacts that speak volumes about the history of the then princely state) and Kaba Gandhi No Delo (childhood home of Mahatma Gandhi in Rajkot). An activity that everyone is familiar with, wherever you go; shopping! 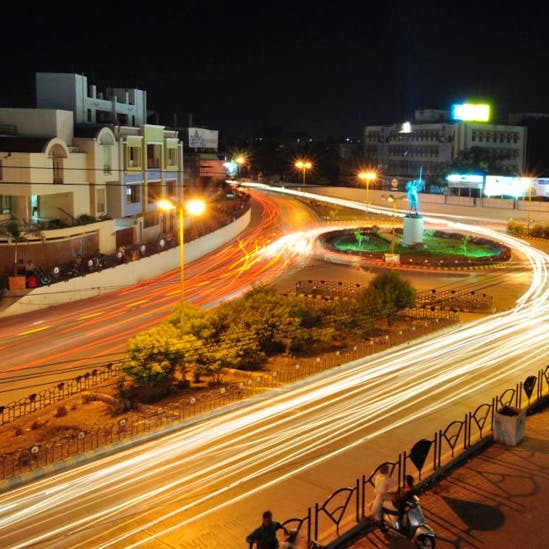 The options for shopping in Rajkot are in abundance. If you love all things handicraft, then you would have plenty of things to buy in Rajkot. Not just traditional handicrafts, the city keeps itself updated of latest trends with the various shopping malls. Check out Gujari Bazaar for buying exquisite handloom and artefacts, especially Bandhani. One of the most popular shopping hubs, Gundawadi is famous for budget shopping where you will find ample options of traditional fabrics and garments. Bangdi Bazaar is another favourite amongst the ladies famous for its variety of bangles and bandhani dupattas.